When you are screening prospective tenants to fill a vacancy at your rental property, you will receive many phone calls from individuals who want to view the property. The information can be overwhelming, so there are certain things you will want to record about each tenant, whether it was just a phone call, an in-person visit or if the tenant filled out a rental application. Learn seven vital pieces of information to keep on prospective tenants that can help you in the future. You may know that you should keep records on your current tenants, but you may not realize the importance of keeping records on the tenants who did not rent your apartment. These records are important for three reasons. You already have information in case tenant calls again in the future. Helps you understand why tenant did not rent the apartment. Serves as evidence in case you are accused of housing discrimination. The records you keep on prospective tenants will depend on how far along the tenant got in the application process. For some prospective tenants, all you will have is a first name and phone number, and for others, you will have a completed application and a deposit to hold the apartment. Even if the tenant has no further interest in the property, this list can help you in the future. Anytime a prospective tenant calls, you should search the phone number in the spreadsheet. While this method is not foolproof, as people do change their phone number, it can help you discover if a prospective tenant has called before. For example, if a tenant who called five months ago is calling again to view a property, you should consider the possibility that they were evicted. You should have a list of qualifying questions that you ask every prospective tenant before they even view the property. These questions can give you a basic understanding of the tenant’s situation. Do You Have Rental Assistance? These questions will not only allow you to determine if a tenant is qualified to rent your property, but will serve as a comparison to what the tenant fills out on the rental application if they get to that point. Also, if a prospective tenant calls again in the future, you will be able to compare their current information to the previous information that you have on hand. Did They Call to Cancel? When prospective tenants are viewing the property, you should make notes of what they do and do not like about the property. It can help you determine the positives and negatives of your property. Some negatives can be easily fixed, such as an ugly paint color, while others, such as a third-floor walk-up, are not so easily fixed. In these situations, you must try to play up the positives, such as, if you are on the top floor, you get the best sunlight and there are no tenants above you. These positives and negatives can also serve as advice for future purchases. If many tenants have commented on the lack of a washer and dryer in your property, that may be something you want to make sure any future property has. If a prospective tenant fills out a rental application, you should keep a copy of this, even if they do not wind up renting the unit. It is good proof in case a prospective tenant tries to accuse you of housing discrimination. You can show that you rejected the applicant because they did not meet the qualifying standards you have for all applicants, such as their income was not equal to at least two times the monthly rent. 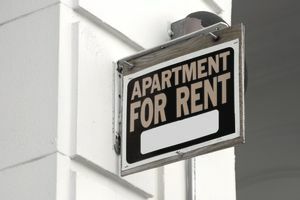 If the prospective tenant does wind up renting the unit, you can use the application to compare to the information they put on the lease agreement. ​If the prospective tenant passes the initial qualifying standards and you take the next steps to conduct credit checks, background checks, and employment verification, you should keep this documentation. If the prospective tenant does rent the unit, it can go in their file. If you reject the applicant because of information discovered in this screening process, you have proof as to why you rejected the applicant, such as they did not work at the company they said they worked at. You should state clearly why you rejected the applicant. You can only reject applicants for lawful reasons, such as they do not meet the minimum income requirements, too many people would be living in the rental or they have a violent criminal history. You must adhere to the Fair Housing Laws. ​If a prospective tenant has signed a deposit to hold the unit and has given you money, keep this documentation. State laws will vary, so check with your state. Some states give tenants three days to back out of this Deposit to Hold agreement without penalty. Usually, if a tenant signs this agreement, they are agreeing that they will rent the unit or, if they do not, are acknowledging that they will lose any deposit they have put down. Having a signed copy of this document can protect you if a prospective tenant tries to claim you unlawfully withheld their deposit.